Our premium clients travelling Business Class enjoy top-quality refreshments included in the ticket price on all flights operated by us across Europe and to the Near East. Based on the time of day and the aircraft used on the route, we serve breakfasts, hot or cold menus in Business Class on porcelain. Irrespective of the type of aircraft used to service the route, we offer, alongside traditional welcome drinks, cold breakfasts, featuring a cold meal, a selection of cheeses and vegetables, fresh fruit and a fresh pastry, butter and jam, on all Czech Airlines-operated short-haul flights with departures before 10 am local time. You will be able to select from five breakfast menus including a vegetarian option. If a route is operated exclusively by jet-engine aircraft, a fruit yoghurt will be offered with breakfast. You will also be able to choose hot and cold soft and alcoholic drinks on offer. Alongside traditional welcome drinks, our crew will offer you hot menus, featuring a hot meal, salad, dessert, a fresh pastry and butter, including unlimited selection of hot and cold soft and alcoholic drinks, on all our flights across Europe and to the Near East with departures after 10 am local time operated exclusively by jet-engine aircraft irrespective of the duration of the flight. There are five different hot menus to choose from including a vegetarian option. On our flights with departures after 10 am local time on routes operated by turboprop-engine aircraft or a combination of turboprop and jet-engine aircraft, we will offer you cold menus, featuring a cold meal, dessert, a fresh pastry and butter, including unlimited selection of hot and cold soft and alcoholic drinks. You will be able to select from five cold menus including, naturally, a vegetarian option. You can book the menu you wish to enjoy in-flight when buying a ticket provided you do so via our website. You can also do it later using the MY BOOKINGS application. If you do not find the time to choose a menu at least 24 hours prior to the departure of your flight, we will offer you a menu on board from the standard selection for the given time of day. We only provide passengers with tickets purchased under the FLEX price package with free in-flight refreshments on our routes across Europe and to the Near East. Passengers with tickets purchased under the LITE or PLUS price packages can order our GOURMET MENUs in advance or purchase light snacks and drinks on board. If you hold a ticket purchased under the FLEX price package, aboard the aircraft, we will serve you a light snack in a box, comprising a fresh Ciabatta bread with chicken meat, a piece of chocolate or biscuit and water, as your free in-flight refreshments. 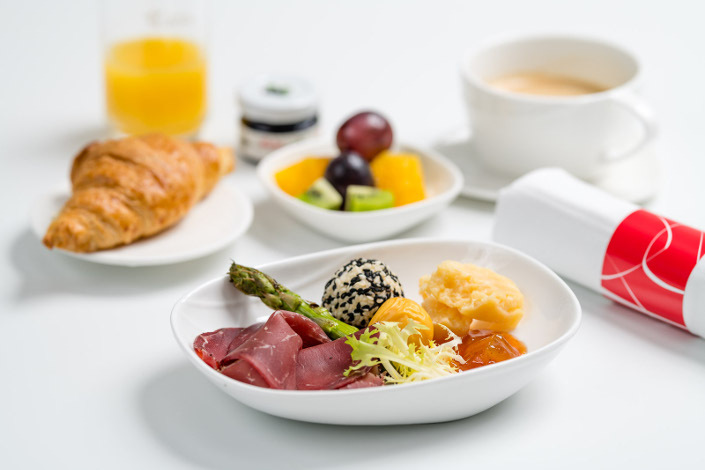 If you wish to get breakfast, hot or cold GOURMET MENU service, you can buy it based on the selecting provided for the particular time of the day and the aircraft used to operate your flight. In such case, we will serve you only the meal you purchased during your flight. 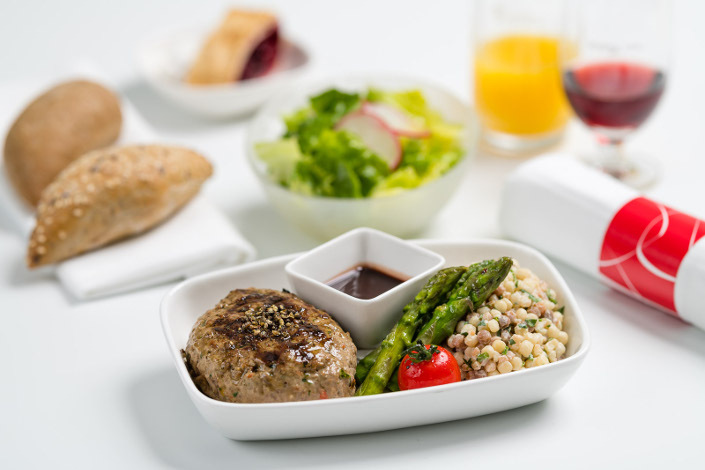 Passengers with tickets purchased under the LITE and PLUS or FLEX price packages can now order our hot and cold meals offered as part of the GOURMET MENU service based on their preferences, provided they do so at a minimum 24 hours before departure. Every purchased menu also includes three drinks which will be offered on board: a soft drink, an alcoholic drink (beer or wine) and a hot drink. Order GOURMET MENU online here. Did you not have the chance to order your breakfast or a hot or cold GOURMET MENU before departure? Would you like to get a drink or a light snack during your flight? During all regular Czech Airlines and Smartwings-operated flights, you can select from the identical BISTRO-ON-BOARD offer and purchase, for example, panini, French quiche or penne arrabbiata, which will be heated on board by the crew upon request. The offer also includes stuffed baguettes, a tapas snack box with Serrano ham, chorizo, tomato-oregano dip and crackers or assorted fresh doughnuts, alongside a selection of sweet and savoury snacks, such as chocolate sticks, crisps, pickled olives, peanuts or cashew nuts. You can also order hot and cold soft and alcoholic beverages, including traditional Czech lager beer, French wine and Champagne. On top of that, there are several menu deals. Please note, the selection of hot meals may be limited on some ATR aircraft-operated flights. You can pay for your in-flight purchases of refreshments with cash in Czech crowns (CZK) or Euros (EUR) or use VISA and MasterCard payment cards. 20 Euro-cent is the smallest coin accepted with cash payments in Euros. If you pay cash using Czech crowns, we will accept all valid circulated coins from CZK 1. BISTRO-ON-BOARD in-flight refreshments are offered on all regular Czech Airlines and Smartwings-operated short haul routes across Europe, to the Near and Middle East and to North Africa, but not on medium- and long-haul flights. The current BISTRO-ON-BOARD in-flight refreshments offer is available for download here. Full in-flight refreshment service is included in the ticket price on all our Medium-Haul (e.g. to Riyadh) and Long-Haul flights (to/from Seoul) irrespective of travel class and thus enjoyed by all passengers on these flights. Two services with the option of selecting the main course during the main service are provided. Working with renowned Czech chefs, we prepare the specialities served on our Medium-Haul and Long-Haul flights using fresh, top-quality ingredients. All ingredients used to prepare meals for the Prague – Riyadh route are in halal quality. Our crew will offer you two services with hot meals and fruit skewers, fruit and sweet and savoury snack in between on our Prague – Seoul route. You will also be able to choose from a wide selection of soft and alcoholic beverages by traditional Czech producers, such as original Pilsner beer and quality Moravian wines. During the main service, you will be offered a choice of two soups and three hot meals based on your preferences, representing either the European or traditional Korean cuisine. Served on porcelain, you will receive a starter, a soup, a main course of your choice, a salad, selection of cheeses, a dessert or ice-cream of your choice and a fresh pastry with butter. The second service will depend on the time of the day and will either include a hot breakfast or dinner. Two services will be provided on our Medium-Haul route between Prague and Riyadh, one featuring a hot meal and one featuring a cold meal. You will also enjoy unlimited supply of soft and alcoholic as well as hot and cold beverages during the flight. We will only serve alcoholic drinks upon request. The main service will feature a starter, a main course of your choice (a selection of two meals representing international cuisines), a salad, selection of cheeses, a dessert and a fresh pastry with butter. The second service will feature a cold snack and a dessert. Our Long-Haul route between Prague and Seoul features two hot services, namely a hot meal, a salad, a dessert and a fresh pastry with butter. A selection of two meals will be offered during the main service, representing either the Czech or Korean cuisine. You will also be able to choose from a wide selection of soft and hot beverages complemented by traditional Pilsner beer and quality Moravian wines. All in-flight refreshments are included in the ticket price. Two services will also be provided on our flights between Prague and Riyadh, one featuring a hot meal and one featuring a fresh stuffed baguette. A selection of two meals will be offered during the main service with a salad, a dessert and a fresh pastry with butter. You will also enjoy a wide selection of soft and alcoholic as well as hot and cold beverages during the flight. We will only serve alcoholic drinks upon request.